Strategic planning season once again upon us. It is occasionally helpful to take a big step back from the annual planning cycle and truly contemplate the long term future of the credit union industry and the strategic implications this has for your credit union. Before we look forward let’s look at where we have been during the last four decades. Credit unions have been merging at the rate of 2.9 percent per year since the industry reached its peak in 1969 with nearly 24,000. At the end of 2013 there were less than 6,800 credit unions in existence according to CUNA’s Long Run Trends Report. During the same time period credit union assets have grown from $17.8 billion to $1.1 trillion. This represents an average annual growth rate of 10%. The average asset size of mergers continues to increase (see July 2014 Merger Approvals). Whereas in the past mergers were almost exclusively driven out of financial necessity, today’s mergers as increasingly strategic. At year end 2013 the average credit union had grown to nearly $160 million in assets. Just 13 years earlier the average asset size was $42 million, a quarter of the size of today’s credit unions. 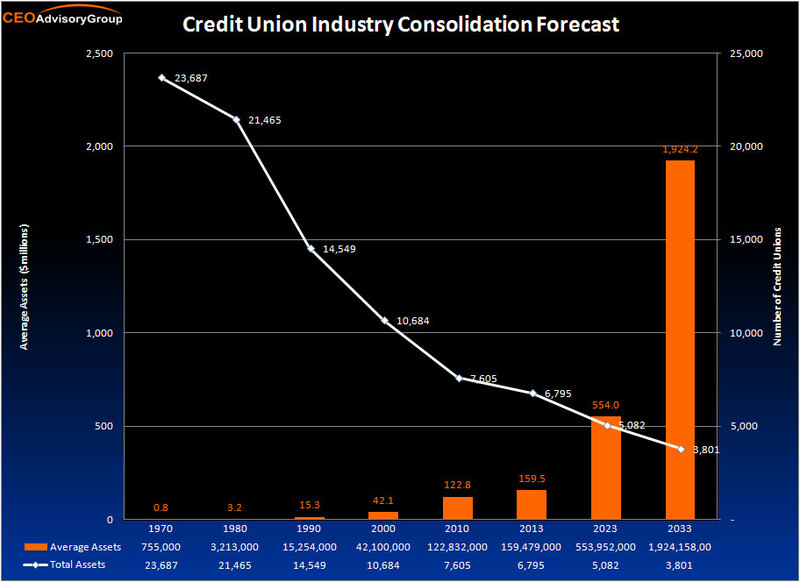 If we extrapolate this growth and consolidation 10 years into the future, as shown in the chart below, the average credit union size will be nearly $600 million. And, in 20 years the average credit union will be nearly $2 billion. Contemplate that for a second. What are the implications for your credit union? How will the intra-industry competition change? How can your credit union compete/survive? What strategic decisions does your leadership need to take today to ensure that your credit union is well positioned to compete in the future? Economies of scale have significant implications within the credit union industry. Larger credit unions, generally those over $500 million in assets, are able to redeploy their operating efficiencies into better rates, higher loans/share ratios, infrastructure improvements, and member technologies. Asset size is also correlated with higher ROA, which in turn allows larger credit unions to maintain higher asset growth rates without compromising the Net Worth/Asset ratio (Net Worth growth is roughly equivalent to ROA). Consequently, as illustrated in the table below, credit unions in the largest asset peer group enjoyed 0.96% ROA and were able to grow assets over 9%. 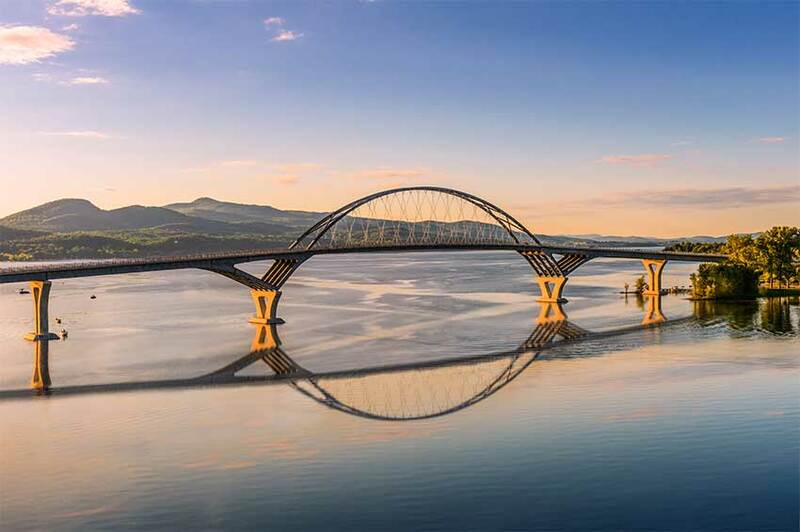 Will credit unions in the future be able to fuel growth from within their existing geographic markets or will they need to expand their footprint? Is your geographic expansion constrained by the NCUA or state regulator? Will mergers become ever more critical as a means to achieve charter expansion opportunities? How will the consumer behavior for financial services change as we become accustomed to mobile phones and tablets for purchases and transactions? With the proliferation of new competitors intent on disrupting the traditional banking landscape, is the current credit union charter sufficient or will credit unions need to acquire charters to stay relevant? Increasingly both small and large credit unions are entering into strategic discussions to try to better understand models of collaboration that will enable them to enjoy stronger future. From the joint meetings we have facilitated there is genuine interest among the leaders to keep an open mind towards finding solutions that will ultimately benefit their membership and employees.